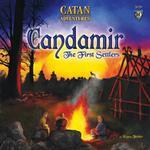 With the new Catan-game "The First Settlement", Klaus Teuber distances himself the most from the well-known game mechanics of the Settlers series. Players take on the role of newcomers to Catan and learn how the adventurous life in the first settlement played itself out. They explore, using a new movement mechanic, for the raw materials they need to build the settlement. Along the way, they discover useful natural products - but also encounter wild animals and are confronted with adventurous situations. Those who survive these encounters obtain the raw materials they sought as well as experience points that improve the abilities of the player's character. Over time, then, the player becomes stronger, smarter or more charismatic and is better and better suited for the dangers of the wild. Back in the village, the natural products can be used to brew beverages while the raw materials are used for building. Through this building, the settlement grows and players obtain victory points. The main attraction of the game lies in the exploration of the island and the development of the individual player characters. But trading and interaction between the players is also important.